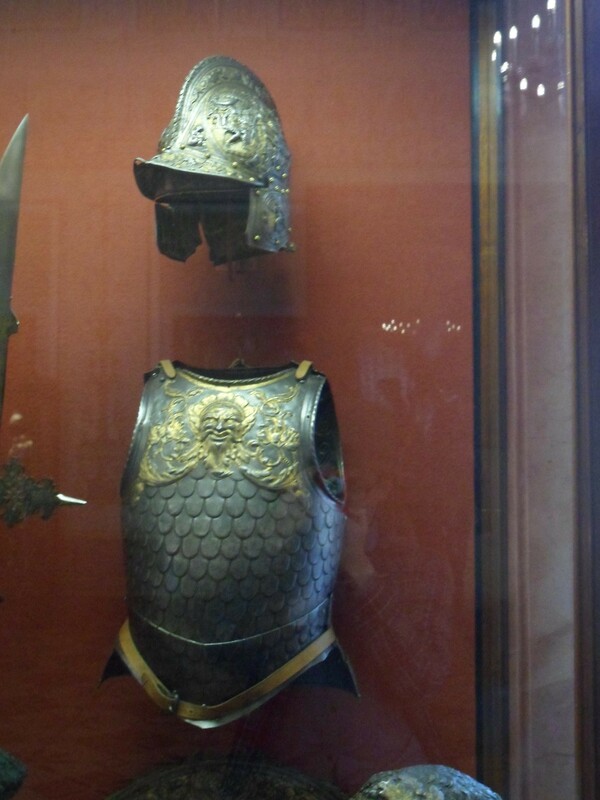 A burgonet and cuirass alla antica in the State Hermitage Museum, St. Petersburg. No information from label available. Photo by Sean Manning, September 2015. Trying to interpret armour in art is not a new project. By the beginning of the sixteenth century at the latest, Italian armourers were looking at Roman coins and sculpture and paintings (and perhaps the odd scrap of bronze pulled from a tomb) and trying to decide how to give their customers their own Roman armour. In this case, the armourer looked at one of the statues of a Roman emperor wearing a form-fitting breastplate of scales with embossed decoration, and tried to imitate it with a few nods to the taste of their own day. But not all is as it seems. 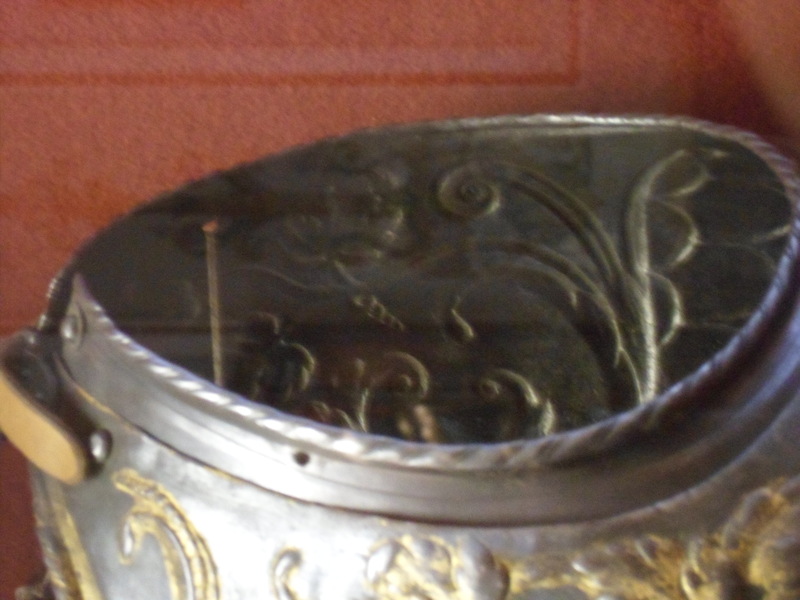 Detail of the collar of the armour alla antica showing the repoussee of the upper breast and back from the inside and the gilding on the outside. Photo by Sean Manning, September 2015. The relief on the upper breast is repoussé and gilt, probably by painting it with gold dissolved in mercury and burning it on. A look inside the neck opening makes this clear. 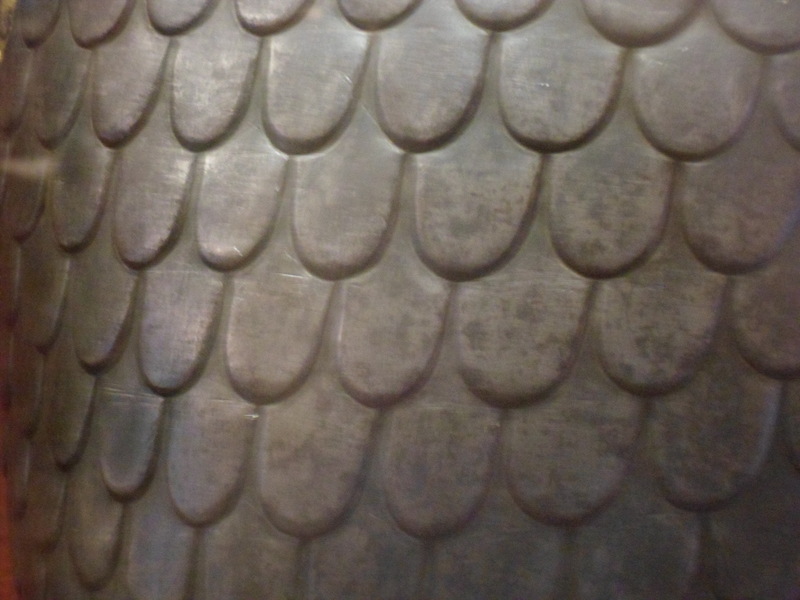 Closeup of the fake scales on the armour alla antica in the State Hermitage Museum, St. Petersburg. Photo by Sean Manning, September 2015. And the scales are also repoussé. In an age when plate had become the most popular kind of body armour, and wearing scale was increasingly hard to justify, the armourers just hammered a cuirass of plate to look like scale. Japanese armourers indulged in similar tricks, disguising their armours of riveted lames to look like laced scales. Yet without a closeup photo, it is very difficult to be sure that the scales are fake. Any ancient sculpture or painting of armour can be interpreted in several ways, and without archaeological evidence or parallels from armour in other cultures its hard to say which is right. Further Reading: Stuart W. Pyhrr and José-A. Godoy, with essays and a compilation of documents by Silvio Leydi, Heroic Armour of the Italian Renaissance: Filippo Negroli and his Contemporaries. Metropolitan Museum of Art: New York, 1998. Free PDF version. Anthony J. Bryant, Nihon Katchû Seisakuben: An Online Japanese Armour Manual (link). A modern armourer known for his work in repoussé (and for some of his other hobbies) is Ugo Serrano of California.